The Murray–Darling Basin is a diverse and complex river system, with its different environments, communities and users constantly in a state of change. The Basin Plan was created to ensure a balance is achieved between the water made available for community, industry and environmental purposes. The recently released 2014-15 Basin Plan annual report highlights progress made by Australian and state governments in improving the health of the river system across the Basin. In 2014–15, the Murray–Darling Basin Authority (MDBA) continued working with Basin governments and communities to maintain a healthy river system. This included reviewing the Basin Plan’s settings for community wellbeing, creating healthy and resilient rivers, wetlands and floodplains, and ensuring a cooperative and inclusive approach to managing the Basin’s water resources. The MDBA continued to monitor the factors driving social and economic changes throughout the Basin to better understand and support community wellbeing. Community wellbeing within townships was measured by looking at indicators such as economic activity, community condition and water use. These measures were used to identify communities more susceptible to change in water reform, even though there will be a delay between the recovery of water and the changes in economic and social conditions. 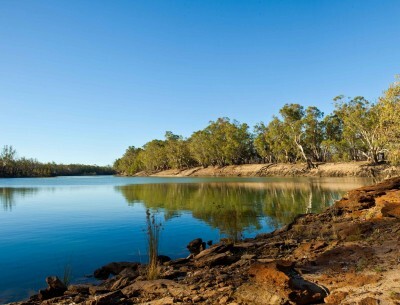 Governments also contributed to improving the Basin community’s wellbeing by supporting infrastructure improvements, undertaking investigations into water markets and pricing, and improving water quality throughout the Basin by diverting 432,000 tonnes of salt from waterways on which they rely on. Children playing in Murray River, Renmark. In 2014-15, the MDBA released the first ever Basin-wide environmental watering strategy which outlined the long term environmental plans and outcomes expected for the Basin. Signs of improved environmental health have already been observed in localised areas, with water bird populations booming after of environmental watering events – achieving far more than the 2019 aim, which is to stop the decline in environmental condition. Dr. Kate Brandis, Research Fellow with the Centre of Ecosystem Science at the University of New South Wales, further discusses the importance of water management within the Basin to ensure healthy water bird populations in a video released with the Basin plan annual report. Communities are also already experiencing the benefits of environmental watering, such as improved recreational fishing and improved pasture for grazing. As the environmental watering strategy progresses, the list of benefits seen by communities and the environment will only grow. The actions of Commonwealth and state organisations must be coordinated for the Basin Plan to be as effective as possible. The Basin Plan annual report highlights the way communities, stakeholders and water management authorities have worked together in 2014-15 to ensure management strategies provide economic, social and environmental benefits. In 2014-15, the MDBA launched the Aboriginal Waterways Assessment program. The program allows users to investigate the cultural significance of waterways, allowing the needs and preferences of Traditional Owners in the Basin to be recognised. In a video released with the Basin plan annual report, the MDBA explores the Traditional Owners participation in water planning and management throughout the Basin and how their involvement can educate water managers and communities about Aboriginal water needs. The MDBA will continue to gather information to identify long-term social, economic and environmental trends to help inform management strategies that benefit those who live and work in the Murray-Darling Basin.